We’re in the ocean almost everyday, but we only get on a boat once or twice a month. ONLY? Yes, we’re blessed. That being said, we have some favorite Maui boat trips worth mentioning. 65 feet of sleek beauty comprises the Kai Kanani—a lovely yacht that’s docked just off the famous shores of Makena. Known for their environmental stewardship—the company works with a number of organizations to shield and preserve Maui’s marine life—the Kai Kanani is sailing at its finest. Their early bird Express Molokini Snorkel Tour arrives at the popular islet long before other boats appear on the horizon, thus providing guests with bounteous time to swim and explore in private. 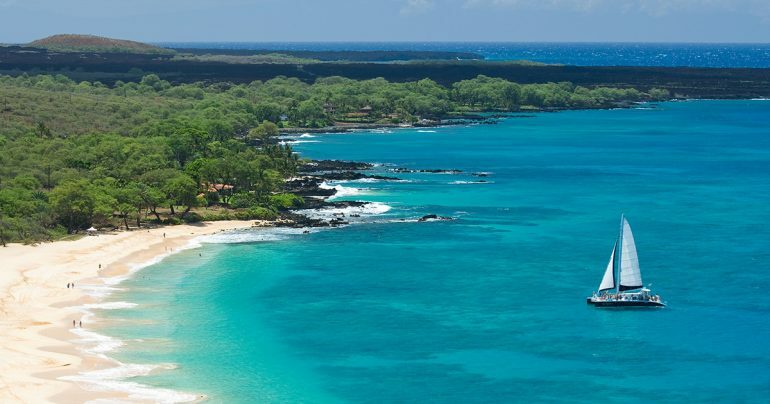 Mid-morning, the stunning vessel takes to the sea again, offering a 4-hour deluxe tour that ferries guests from Maluaka Beach to Molokini to a hub of Hawaiian Green Sea Turtles. Continental breakfast is served, as well as a deli-style lunch, locally-crafted beers, and Mai Tais. Have you always wanted to break out the bubbly while soaring across the sea? Fulfill your wish with their sunset dinner cruise, which includes a premium bar and pupus that range from shrimp cocktail to fresh fruit. Whale season is right around the corner! When it comes to whale watching, being on a boat is important. Yes, you can see whales from the beach and some lookouts but not at the proximity afforded from a boat. We particularly enjoy being on rafts because they’re so low to the water. We’ve been “mugged” by humpbacks (meaning they swarm around the boat not allowing us to turn on our engines) many times, and being on a raft makes it that much more exciting. The Pride of Maui has garnered a great reputation for its five-hour snorkel tour, which propels guests to Molokini aboard a power catamaran that features 3,000 square feet of sun-splashed deck space and a glass bottom that showcases Maui’s underwater treasures. Further, the Pride of Maui provides SNUBA diving, which, utilizing a SNUBA raft and harness, permits topnotch views of the Pacific’s wildlife. From Halloween to the Fourth of July, Valentine’s Day to weddings, this well-manned ship also offers a catalogue of ways to celebrate special events. Who hasn’t daydreamed about gliding across the Pacific on a glossy yacht? Leilani satisfies this desire in spades, supplying 50 feet of glamour aboard its Uniflite power vessel. On top of daily snorkeling and SNUBA tours, this luxe boat also offers heaps of romance—their couples cruise was designed for lovers, and comes with a private dinner, luscious cocktails, and lilting music. But it’s the sunset views that will really race your heart—and remind you that, whether by sand, sea, mountain, or forest, Maui is nothing short of remarkable.